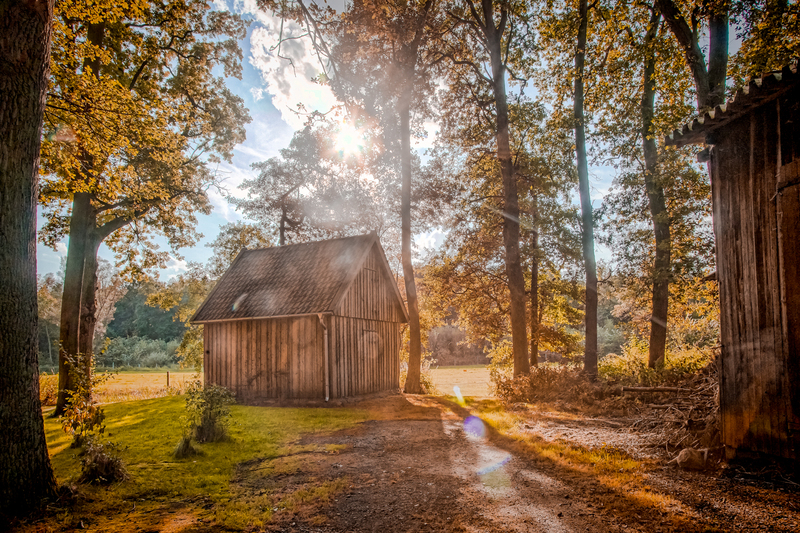 A wooden hut, in the forest of Müden am Örtze (Lower Saxony, Germany). A handheld HDR photo I shot on a recent holiday trip we took. I had arrived the evening before and liked how the sun set between the trees and over the house but I didn’t have my camera with me. I shot it with my iPhone, I liked it and was wondering if I could make it better with a real camera. Here is the iPhone version that I posted on my mobile photo Flickr feed. I particularly liked how I managed to get those two horses almost posing in perfect harmony. The small black pony and the white horse are even more interesting than the house. But despite all I tried, the horses weren’t interested in doing that pose again. So I just waited for them to leave. Here is the HDR version I shot with the real camera. As I was shooting it handheld I had to bump up the ISO to 1600, I could have avoided that if I had opened the aperture to 4.0 which is the best my lens can do, but if I had done that the sun would have totally over-exposed so I had to close the aperture to 16 and I lost on the iso. I then worked the three images in Lightroom, then Photoshop HDR, then Topaz and back to Lightroom. I’m not very familiar with Photoshop HDR, plus I haven’t been doing much photography so it took a bit of time. My biggest hurdle with Photoshop HDR was to not get the “HDR look” and try to keep natural. I had to manually unsaturate it a lot, plus quite some tweaks. About Müden: We went to visit the Berlin Air Lift museum in Fassberg which is quite interesting, if you’re interested in Berlin’s history – how the food, coal and supplies of an entire city of 2m people was managed by airfreight for an entire year. Then while you’re over there and have a camera go visit Celle, the city is quite impressive with almost 500 half-timber houses still standing in use. A castle and plenty of other great stuff to shoot. I didn’t have my camera and was only there during the afternoon so not much to shoot. 14 Sep	This entry was published on September 14, 2014 at 7:50 pm. It’s filed under Canon 5D Mark II, Forest, HDR, Landscape, photography, summer, Sunset and tagged Forest, germany, green, HDR, house, Muden am Ortze, photography, trees. Bookmark the permalink. Follow any comments here with the RSS feed for this post.